I may have gotten the engagement ring of my dreams, but that doesn't mean I don't still enjoy browsing! This Victorian turquoise and diamond beauty from Erstwhile Jewelry Co. caught my eye, along with this moonstone bauble. Should I consider it a sign that the moonstone ring is in my size? Tell me, married gals; do you still browse your favorite jewelry shops from time to time? And would any of you wear a ring like this one as a sign of your engagement? I want a very classic engagement ring do I can hand it down, but this one is lovely! so beautiful... love that deep color! That ring is fabulous!! I would wear that as an engagement ring in a heart beat!! Wow...so different which ups the cool factor. Ya know, at the end of the day...I'd wear any ring because I think it's more about the symbol. Am I nuts? I went the classic route for my engagement ring & I couldn't love it more. I adore the delicate detailing around the moonstone on this ring. It would be very pretty on my right hand! Oh I'm constantly looking at jewelry :) Jared mentioned either getting me a right hand ring or another band for to go with my wedding rings a couple of months ago and I can't stop looking/thinking about it! Absolutely! What a fabulous ring!! and it just happens to come in my favorite color!! That is stunning. I love looking at engagement rings and wedding rings, it never gets old even after a year of marriage. I DO browse! I love my ring but its fun to look. I love my ring but that doesn't mean I don't love looking at others. It's like anything beautiful--hugely and constantly inspiring! That's so beautiful, Lena...what a great find. I think you should definitely consider it a sign that the moonstone is in your size. BUY IT! Love moonstone. Mostly because I'm still five years old and it sounds like something magical, doesn't it? gaah! how did i miss YOURS!? have you posted it yet?! Ohh, this is just beautiful. I love turquoise so much right now! 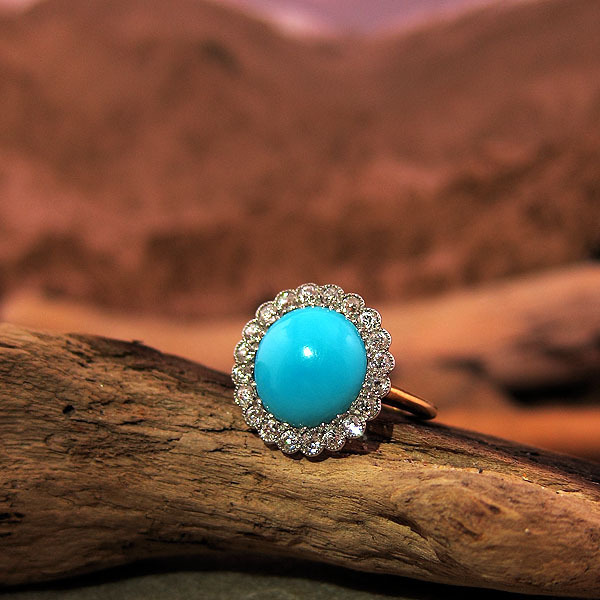 That Victorian turquoise diamond ring is gorgeous. The details if so intricate and elegant. This is a classic piece of jewelry. Sure, why not? Go ahead and tell your hubby how much you like that turquoise ring. I'm sure every loving husband would be happy to give his wife such a beautiful ring. I love the playfulness of this ring's design. And who says weddings should be too serious?